I have been working on my latest sculpture that will be on display for the Forest and Rivers Open Studios this Summer. 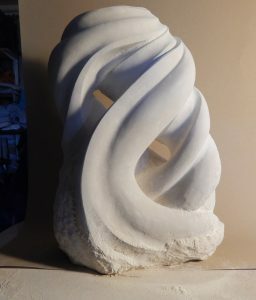 I have also started another carving and I have been busy working on some designs for a series of sculptures with a theme that excites and inspires me; the sea and all the beauty of the shoreline. As you can see my carving is progressing well since my last post and I am looking at the way a broken shell still has an inherent beauty. As you can see there is still a bit of carving to do, I normally don’t concentrate on one side but I needed to have something for the exhibition brochure, now I can get back on with this sculpture as a whole. The second carving is a more literal depiction of the broken shell that I am currently studying. The page from my sketchbook shows some very rough sketches for ideas and shapes that are found within the shell. In this instance I don’t carry out a detailed drawing as this would detract from the sculpture and in a small way box my ideas in.